If you're visiting this page, then you take your privacy as seriously as we do. Here's how our hospital system - and you - can best keep your health information secure. Franciscan Health physician offices have detailed policies and procedures regarding protection of and access to your medical information. Each practice has standards that outline how and when employees can access your information and the circumstances under which your medical information may be released to parties outside the organization. These policies conform to state and federal law and are designed to safeguard your privacy. Employees and physicians are educated in privacy policies. They know they are entitled to access medical information only as necessary to provide care to you or for other authorized, legitimate reasons. A violation of Franciscan Health privacy policies would be considered a serious offense. Failure of an employee or physician to protect patient information from accidental or unauthorized access is not tolerated. For additional information regarding your healthcare provider's privacy practices, please request a copy of the Notice of Privacy Practices from your physician provider office. As we provide your health care, we maintain documentation of your medical history, current conditions, treatment plan and all treatments given, including the results of all tests, procedures and therapies. MyChart is an Internet application that enables a patient to have secure web-based access to selected medical information about the patient. 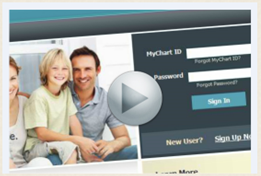 MyChart also allows secure electronic messaging with your healthcare provider. A message you send via MyChart may be made part of your permanent medical record at the discretion of the physician. Once it is made part of your record, it will be accessible to current and future healthcare personnel who participate in your care. When you initially enroll to use MyChart, you will be provided an activation code. With that code, you will be able to create a MyChart ID and password. This ID and password will allow you, or anyone else who has the ID and password, to view your medical information, submit comments that may become part of your record, and communicate with your health care team as if that person were you. For this reason, you should keep your activation code, MyChart ID and password completely confidential. You should prevent disclosure of your activation code, ID or password, and you should change your password if you believe that your security may have been compromised. In addition, you should change your password regularly to help maintain the security of your account. You can change your password online at any time by logging into MyChart and choosing the “Change Password” option. If you have any questions regarding the security of your password, please call 1-877-900-5741 right away. MyChart messaging should never be used for urgent matters. The anticipated turnaround time for response to electronic messages is 3 business days. Therefore, for all urgent medical matters, contact your physician’s office by phone, go to an emergency room or dial 911. All communications between you and your health care team using MyChart are carried over a secure, encrypted connection. While you may receive Internet e-mail messages notifying you of new messages in your MyChart Inbox, these e-mails will not contain any confidential medical information. However, any person with access to the e-mail account to which such messages are sent will be able to see the notifications. MyChart does not reproduce a patient's entire medical record online, but it instead provides access to selected information such as prescriptions, basic laboratory results, summary medical history, appointments and other such information. Even within categories of information that are generally made available through MyChart, posting of information is strictly at the discretion of the individual physician. To comply with applicable laws and regulations, your physician's office provides parents and legal guardians with limited proxy access to minors' health information through MyChart.